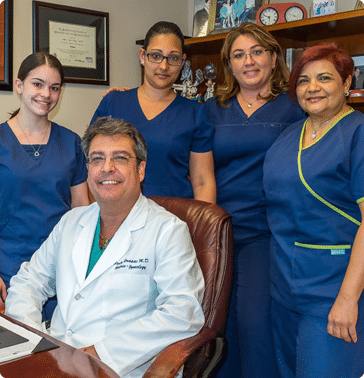 Since 1968, Doral Beach OB/GYN has offered comprehensive gynecology and obstetrical services to adolescents and women in Miami Beach and Doral, Florida. We are committed to being the physicians of choice for women’s health in our community by providing high quality, personalized care to our patients. As gynecologists, we diagnose and treat the full spectrum of women’s health conditions, from menstrual problems and infertility to menopause, as well as perform both inpatient and outpatient gynecologic surgery. As obstetricians, we are here for you throughout your pregnancy, providing full-service prenatal care and delivering your precious bundle of joy. Not only do we serve women in Miami-Dade County, but we also care for patients from the Caribbean and South America who seek to deliver their babies in the US. Doral Beach OB/GYN offers same-day appointments when needed as well as early morning appointments at our Doral office (as early as 8 am). To schedule an appointment, call one of our convenient offices, or you can request one online.